Responding to growing protests, the Vatican has firmly distanced itself from a prelate who denied the Holocaust and demanded that he recant his positions before being fully admitted as a bishop into the Roman Catholic Church. The Vatican also said in a statement Wednesday that Pope Benedict XVI didn't know about Bishop Richard Williamson's views when he agreed to lift his excommunication and that of three other ultraconservative bishops Jan. 21. The furor over the German pope's decision has been spreading, forcing the Vatican to make a remarkable turnaround and publicly call the British bishop to order. The statement was issued by the Vatican's Secretariat of State a day after German Chancellor Angela Merkel urged the pope to make a clearer rejection of Holocaust denials, saying there hadn't been adequate clarification from the Vatican. Further condemnations of Williamson had come from top German Church officials, Jewish groups and the head of the U.S. bishops conference. In a sign the Vatican had misread the mood even among its own officials, the secretary of state, Cardinal Tarcisio Bertone, was quoted in an Italian Catholic newspaper Tuesday as saying he considered the matter closed. The controversy gave a rare look at the cracks in Vatican's facade of unity and raised questions about the advice the pope receives and his access to information. Papal aides say Benedict, a former university professor and theologian, receives a daily news summary and occasionally watches television. "This was absolutely a matter that was bungled at the highest levels of the Vatican," said Rabbi Marvin Hier, founder of the Simon Wiesenthal Center in Los Angeles. "If they Googled the name 'Bishop Williamson,' they'd find out he was a Holocaust denier. This did not require advanced research at the Vatican Library or Oxford." Hier said he took the pope at his word that he didn't know Williamson's views. In the rare public spat, some leading cardinals in Germany and at the Vatican blamed unidentified aides. Williamson was shown on Swedish state television days before his rehabilitation was made public, acknowledging he said some years ago that "There was not one Jew killed by the gas chambers" during World War II. He said historical evidence "is hugely against 6 million Jews having been deliberately gassed in gas chambers as a deliberate policy of Adolf Hitler." Williamson subsequently apologized to the pope for having stirred controversy, but he did not repudiate his comments, in which he also said only 200,000 to 300,000 Jews were killed during the war and none were gassed. "Germany has paid out billions and billions of deutschmarks and now euros because the Germans have a guilt complex about their having gassed 6 million Jews. Well, I don't think 6 million Jews were gassed," he said. The controversy threatened to mar Benedict's strong record in building Catholic Jewish relations, which included visits to the Nazi Auschwitz death camp in Poland and synagogues in Germany and the United States. 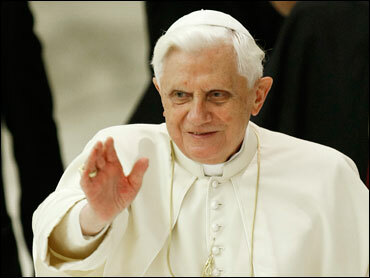 Jewish leaders welcomed the Vatican's statement Wednesday. "Had all this been expressed at the outset, we could have avoided the unnecessary damage and distress," Rabbi David Rosen, international director of interreligious affairs of the American Jewish Committee, said in an e-mail following Wednesday's statement. Williamson and three other bishops were excommunicated in 1988 after they were consecrated by the late ultraconservative Archbishop Marcel Lefebvre without papal consent. Lefebvre founded the traditionalist Society of St. Pius X in 1969, opposed to the liberalizing reforms of the Second Vatican Council, including its outreach to Jews. The Holy See said when it announced the rehabilitation of the bishops Jan. 24 that removing the excommunication did not mean the Vatican shared Williamson's views. In the statement Wednesday, the Vatican said that while Williamson's excommunication had been lifted, he still had no canonical function in the church because he was consecrated illegitimately by Lefebvre. "Bishop Williamson, in order to be admitted to episcopal functions within the church, will have to take his distance, in an absolutely unequivocal and public fashion, from his position on the Shoah, which the Holy Father was not aware of when the excommunication was lifted," the statement said. Shoah is a Hebrew word used to denote the Holocaust. In addition to its demand of Williamson, the Vatican said that the society as a whole must fully recognize the teachings of Vatican II and the teachings of all the popes who came during and after it in order to have a legitimate canonical function in the church. Jewish groups welcomed the Vatican statement, saying it satisfied their key demand. "This was the sign the Jewish world has been waiting for," said Ronald Lauder, president of the World Jewish Congress. Elan Steinberg, vice president of the American Gathering of Holocaust Survivors and their Descendants, thanked Merkel for her "righteous comments" and said the process of healing the "deep wound that this crisis caused to the Catholic-Jewish dialogue" could now begin. Last Wednesday, Benedict said he felt "full and indisputable solidarity" with Jews and warned against any denial of the full horror of the Nazi genocide, but they fell short of demands that the bishop be publicly reprimanded. There was no answer to several calls placed to Williamson's home in La Reja, Argentina on Wednesday. Williamson could face charges in Germany, where he was interviewed by Swedish TV. State prosecutors have opened a preliminary investigation into whether Williamson broke German laws against Holocaust denial.